Dexter Daily: Michael C. Hall on Sundance Channel's The Writers' Room: "My Initial Response to Dexter Was Aversion"
Michael C. Hall on Sundance Channel's The Writers' Room: "My Initial Response to Dexter Was Aversion"
Dexter is the topic of this week’s edition of “The Writer’s Room,” airing at 9 p.m. Monday, Aug. 12 on Sundance Channel. In the provocative third episode of “The Writers’ Room,” host Jim Rash and Entertainment Weekly editor Dan Snierson sit down with the writing team behind Dexter, the Emmy Award-winning show about everyone’s favorite serial killer, starring Emmy-nominated actor Michael C. Hall. The group shares their thoughts on the real tragedy behind Dexter’s character and reveals some of the “bad” ideas that were left dead on the writers’ room floor. Hall also shares his perspective on the similarities between his character David Fisher (Six Feet Under) to his character in Dexter: “I kind of feel like David Fisher was Dexter Morgan’s first victim,” says Hall. In an engrossing half-hour, Hall, Sara Colleton and the writing team, delve into what it’s like to tap into your dark side. Skip the jump to read some excerpts from the Dexter episode! Executive Producer Sara Colleton on Michael C. Hall portraying David Fisher (“Six Feet Under”) and Dexter Morgan: For the first year, people said ‘how could David Fisher be Dexter’ and now people who only know him as Dexter discover Six Feet Under and they go oh my god how could Dexter have been David Fisher? And, in person, Michael [C. Hall] is like none of those characters at all. 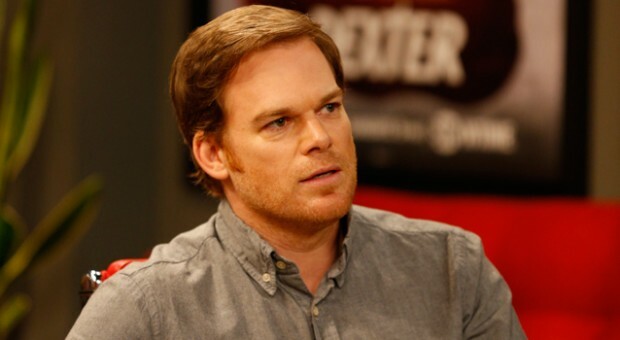 Michael C. Hall: I kind of feel like David Fisher was Dexter Morgan’s first victim. Michael C. Hall on the tragedy behind his character: I mean, I think the tragedy of the character is that it’s not his darkness that gets anyone in his life in trouble – it’s his appetite for light, or connection, or humanity. It’s his desire to have his cake and kill it too. The audience on embracing Dexter: Jim Rash: What is it that has allowed us to, from the very beginning, embrace this serial killer? Sara Colleton: What I think is that every step along the way we have always tried our very best to root where Dexter is by first asking ourselves, what are the normal questions or the normal wants or desires of a human being? And then you refract that through the prism of Dexter. Morgan. It gives the audience a way, in a very safe environment, to explore their own nature. Jim Rash: Do we all have that dark side? Sara Colleton: Absolutely, we all have a dark passenger. We all have that side of ourselves that we are terrified of letting it see the light of day. Michael C. Hall on walking into the writers’ room: There was one day where I walked into the writers’ room, and I was in there like three minutes trying to articulate something and everybody was chiming in and I had to leave– it was like walking into a rip tide. I appreciate that this is a very collaborative endeavor, and I don’t try to do anybody else’s job. I think I feel like I’m the guardian of my sense of Dexter’s truth. "I had just a few months before being presented with the pilot script finished Six Feet Under and the last thing I thought I'd do was another television series," Hall explained. "My initial general response to the idea of It was aversion. I didn't want to make another open-ended commitment to a character surrounded by dead bodies." But after reading the script and Lindsay's novel, Hall says he "recognized that this was a singularly unique character and I wasn't going to get the opportunity to do anything like it anywhere else, so I took the leap." Michael C. Hall on justifying Dexter’s murders: It’s not like he’s killing girl scouts.